You know you want to see a good movie when you drive 33 miles, one way for its 9:15pm showing in a theater in Detroit. 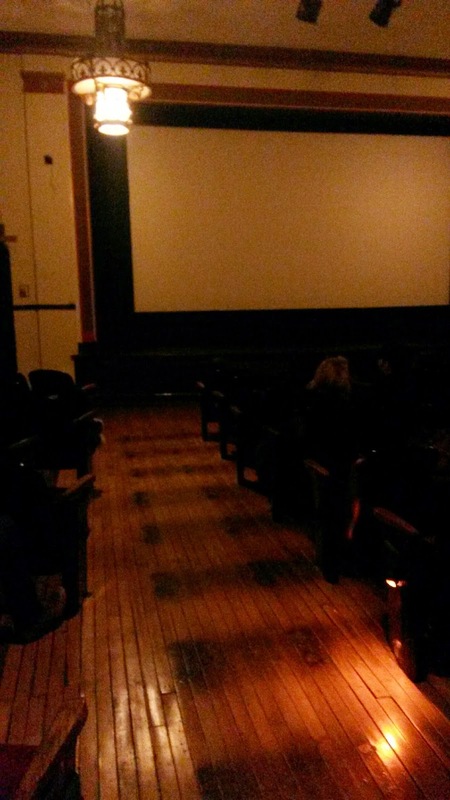 The Babadook was the movie I had to see, and I'm so glad I made the trip! There have been only a select few films that I have driven great distances to see, and all of them were limited release films that weren't going to screen in Ann Arbor, or take another month or so to come here. A tweet made a couple weeks ago by The Exorcist director, William Friedkin, where he wrote that Babadook was the scariest film ever filmed, made my spine tingle and got me excited to see it and hoped that it would play somewhere, anywhere in metro Detroit. Alas, that theater would be Cinema Detroit located at 3420 Cass Avenue. I love to be scared, and horror films and heavy sci-fi films are my favorite genres, so upon reading various commentaries about how insane scary and psychological The Babadook was, I steered clear of spoilers and not reading in depth critical reviews. Thus far, The Bababook has a 98% fresh rating from Rotten Tomatoes and an 86% Metacritic rating. That's unheard of for a straight up horror/monster movie! The Babadook is about a stressed out and socially isolated widow, Amelia (Essie Davis) and her hyper and demanding six year-old son, Samuel (Noah Wiseman). Through flashbacks, we learn that Amelia lost her husband in a horrible car accident, and that Samuel was born that very night. The supernatural elements of the story makes you ponder if there's a connection between the husband's death, the son's birth, and the mysterious arrival of an entity that only the boy is aware of from nightmares. As a long grieving widow, Amelia has a nurse's aide job at a retirement community and that is the only time she has being away from her son who does not get on well with other children, even his own aunt doesn't like him. Eventually, Samuel's dreams start to become more vivid in that he can't sleep in his own bed and he needs his mother's constant assurance and protection from 'the thing' under his bed and in his closet, every night. In order for him to fall asleep, she must read him a bedtime story. This extra care and attention to her son is at the risk of her own need for sleep, and thus leading to mind altering sleep deprivation - a perfect time to be susceptible to something sinister. One day, a mysterious large red book titled 'The Babadook' appears on Samuel's book case and he asks his mother to read it for him. Almost immediately upon opening the book and reading it, Amelia is startled by the disturbing images and the text which was haunting and horrifying, and thus prompting more nightmares for both of them. Thinking she could just rip the book up and throw it away, that would be the end of her problems. Amelia's sanity is slowly breaking down due to not being able to sleep, and after her son's continued disruptive behavior at school and telling everyone about The Babadook, he is removed from school and medicated so that he could sleep. The Babadook makes his existence known at this point and is quite bold. Noises in the house that makes the heart stop, or forces Amelia to hide under the covers, doors opening, panic attacks, heavy breathing, lurking shadows and a menacing ghostly face, all combined make The Babadook a psychologically wearing down horror film. The Babadook takes a familiar plot of storybook induced nightmares and add several desperately needed new twists to modernize this long favored storytelling fable. A film does not need tons of gushing red blood, chainsaws, or zombies to scare the crap out of you, it's the psychological aspect of a true horror film that can do the job. Australian films really tend to think outside of the box and be very unconventional in the story telling, and The Babadook is a prime example of that country's fresh take on horror. The film is playing at Cinema Detroit through Thursday, December 18th. This was my second time watching a film at Cinema Detroit in a year, and I'm so glad that there is a theater of its kind in the heart of the city of Detroit. I had the pleasure to speak with Paula Guthat, the co-founder and CEO of Cinema Detroit, and she explained how they are utilizing a portion of a former school that was built in 1912; the other part is a current Montessori school. Inside the lobby of the theater are artifacts from the heyday of early 20th century cinema house film projectors and other instruments providing a museum quality historical perspective of the evolution of film viewing in cinemas. Paula also told me about the positive buzz Cinema Detroit has received from patrons, and some of them are from far away as New York City, and from Europe. They are most impressed with the re-utilization of such a beautiful space in an area that is in dire need of more re-vitalization. If you're in the area, I encourage you to visit Cinema Detroit and support this lovely theater. The lighted sign which guides you to the entrance way. A few historical early 20th century cinema artifacts. The left side of the theater room 1.